This anecdote makes a vital point about electronics in this fast-moving technology age: they just don’t make ‘em like they used to. It also raises an important question: what should we do with electronic devices we don’t use anymore? 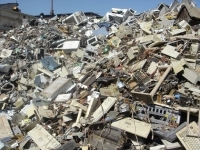 Let’s dive deeper into the problematic issue of e-waste. Cardiff-22nd June 2015. One of the first smartphone repairs businesses in the UK, iPhonefixed, has today announced plans to improve their green credentials by working in conjunction with an eco-friendly cycle courier.